As a recent college graduate, Marisa Boston, Ph.D. '12, was enjoying her new job teaching English to Mexican immigrants in 2001, but she really wanted to go deeper -- to know the science behind language. Why was it easier for some people to learn? What was going on in the brain when people were learning a new language? How could she make it easier for them? Seeking answers to her questions, she pursued a master's degree in linguistics at Eastern Michigan University, where she earned a graduate assistant's job that involved computer programming. "I never felt that I had a strong mathematical background," Boston says. "But eventually I learned to speak that language, too. I took what I learned in linguistics and applied it to computer science and took what I learned in CS and applied it to linguistics." 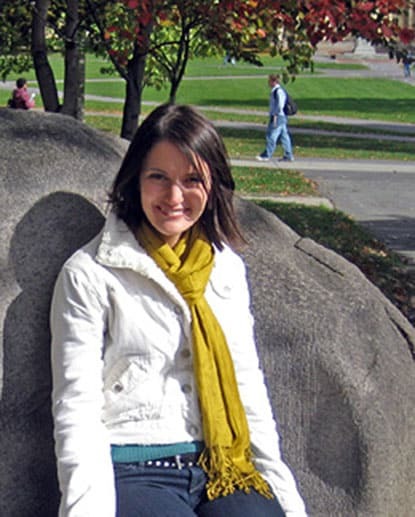 After completing her master's, Boston continued her research at Cornell as a doctoral student in linguistics and computer science in the field of syntactic parsing: She studied what happens in the brain during sentence creation and created computer software that analyzes sentence structure. She worked closely with her adviser, John Hale, associate professor of linguistics, as well as Claire Cardie, professor of computer and information science. "At Cornell, you have an environment that really allows you to focus on being successful academically," Boston says. "There's so much going on that's intellectually stimulating, and everyone is working so hard." Today, Boston is a senior research engineer with Nuance Communications, where she works with IBM's Watson computer, which won fame beating human contestants on TV's "Jeopardy" game show. "This really is a dream job for me -- to be able to apply linguistics to something computational," Boston says of her work, which involves adapting Watson's system into something that could work in the medical domain. The hope for Boston's new project is to provide a system that would allow doctors to ask questions to a Watson-like device about issues such as vaccine scheduling, medication dosing, patient history or new medical technologies, and receive immediate verbal answers. "Medical costs are extravagant, and physicians are overworked and rushed," she explains. "This technology could make a real difference for both doctors and patients." Nuance has a special agreement with IBM to work with the Watson technology, and even though the system is advanced enough to answer "Jeopardy"-type questions, modifying it to become useful for doctors is a complicated process. Boston said her training as a linguist has become just as vital to her new work as her programming skills. "In this job I'm told, 'This is a problem that has to be fixed,' and then I'm on my own," she says. "At the end of the day, what I do is technical -- I can't be scared by reading millions and millions of lines of code -- but I also need the ability to create something myself." For Boston, dabbling in computer programming allowed her to find a skill set she didn't know she had and also made her a more attractive prospect in the job market. "Most employers want to hire people who are curious and smart -- that's what arts and humanities graduates are," she says. "But without technical skills, sometimes you can be passed over. Just taking a class or two in grad school can help." This story first appeared in Ezra Update.